A massive 83 troy-pound, 7.52 troy-ounce silver bar recovered from the shipwreck of the Atocha and estimated at $35,000-up is just one of many treasures to appear in Daniel Frank Sedwick, LLC’s Treasure, World, U.S. Coin and Paper Money Auction 21. The online live auction will be held May 3-4 at www.auction.sedwickcoins.com. Lots can be previewed on the site in the first week of April. The large silver bar comes from one of the richest Spanish treasure galleons lost at sea, the Atocha, which sank in 1622 west of Key West, Florida. One month after sinking, a hurricane scattered the wreck, preventing the Spanish authorities from recovering its treasure. However, modern salvage operations conducted by Mel Fisher in the 1970s uncovered approximately 1,000 silver ingots and over 100,000 shield-type cobs. Coins from the Atocha will be offered in the Sedwick auction as well. Another treasure find from the Atocha appearing in the auction is a gold and red-coral rosary. The rosary was featured in the June 1976 issue of National Geographic Magazine and is pedigreed to a 1988 Christie’s auction. The rosary is estimated at $25,000-up. Bidders can register for the auction at www.auction.sedwickcoins.com in early April. The printed catalog will also be available early April at www.sedwickcoins.com. For more details, please contact Daniel Frank Sedwick, LLC at office@sedwickcoins.com. We’re into the home stretch with only 4 days to go until the auction! We hope you have been bidding and will join us for the live portion. Below are some of the most important artifacts in the auction, and while most of these items will come up at the end of the auction, it’s definitely a case of “last but not least.” Coins–as well as all shipwreck treasure–are our business, and you can be confident that we know what we’re talking about in our descriptions. Why have one coin when you can have several? The above is a large clump of 20+ Mexican cob 8 reales, two in front dated 1714. It’s a very impressive display that stands up well, also a very rare item these days and was recovered from the Spanish 1715 Fleet off the east coast of Florida. You could eat off the above plate today because it’s in such good condition. It’s marked with a tax stamp and LDo.IVo. / RAMYREZ under rim. More important, the underside of the rim bears most of a castles-and-lions circular tax stamp and a stamping in tiny letters that exactly matches lots 41-43 of the Christie’s 1988 Atocha auction, in which that mark was described as an “owner’s stamp.” It is clearly part of a set with this bigger basin; those three lots were only 8-7/8″ in diameter and described as “dinner plates.” They fetched some of the highest prices realized among the silver plates in that sale, upwards of $6000 hammer, but not even close to the price realized for the only large basin (like what we are offering here but slightly bigger), lot 47, which hammered at $22,000! The above is a complete gold plain-loop chain, 34.55 grams, from the “Tricentennial Treasure” find of 2015. There are hundreds of tiny plain links in a tight chain (easily kinked) that is remarkable for being unbroken and complete, eminently wearable and attractive despite its simplicity, also one of the first artifacts from the famous “Tricentennial Treasure” to be offered for sale. From the 1715 Fleet (Douglass Beach site). What’s an auction with out a cannon? The above Danish naval “4-pounder” bronze howitzer from the late 1700s is believed to have been from military and naval stores captured by the British during the Battle of Copenhagen in 1807. Sent to England, these items were used by English forces during the Napoleonic Wars and in America and Canada during the War of 1812. Some ended up in American service due to capture or purchase. The bronze barrel has a chambered bore (which most howitzers have), a designated area for the powder charge, turned decorations and cast with bronze pointing tiller cascabel ending on a rounded ball end. This cannon was made for use as a swivel gun but is now mounted on a mahogany naval deck carriage (complete and serviceable with working elevation screw and wheels) with correct brass and iron mounts and four wheels from the early 19th century (possibly exact replacements made later). The barrel is in excellent condition with minor surface wear and excellent light-brown patina. Once again, we hope you all your bids are winning bids! Today we want to make you aware of some very important silver coins you can bid on in our upcoming Sedwick Treasure, World, U.S. Coin & Paper Money Auction #20. When you see descriptions containing words or phrases like “unique,” “very rare,” “finest known,” and “unlimited value,” you can be sure these items will bring top dollar…and be worth every penny. It bears repeating that we often say you should buy the “best” coins you can afford, whether that means coins in the best condition or of the highest rarity. The good things in life don’t come cheaply but you’ll rarely regret your decision to buy them and enjoy them for years. Good luck in our auction! The above is a Mexico City, Mexico, 4 reales, Charles-Joanna, “Early Series,” coin and those who collect them know that varieties with the assayer mark (P) to the left and mintmark (M) to the right are generally much rarer than others. Also, this is an early variety in Assayer P’s tenure with the use of HISPANIE instead of the later use of HISPANIARVM in the legend on the pillars side. The above is an extremely rare Mexico City, Mexico, cob 1 real Royal, 1643/2P. It is probably unique, but certainly unique in quality and of almost unlimited in value to the specialist collector. The above is a rare Potosi, Bolivia, cob 8 reales, 1634T and the first coin collected by Emilio Paoletti, (and ex-Burzio, ex-Martini, ex-Janson) with copy #1 of Paoletti’s book 8 Reales Cobs of Potosi (3rd ed., 2016) and signed by him on the first page where the number 001 appears. What a remarkable pedigree! The above is a rare Potosi, Bolivia, cob 8 reales, 1652E transitional Type III from the Capitana (1654). What is interesting about this die variety is that the O-E above 52 to right of shield is punched over N-8. The above is a rare Potosi, Bolivia, cob 8 reales Royal, 1714Y with an interesting four-digit date below cross (the standard for 1712-15). The above is a very rare Potosi, Bolivia, cob 8 reales Royal, 1725Y, Louis I, ordinal PRIMERO. Royals of Louis I are among the most desirable and difficult to obtain, particularly since the general coins of this period are so crude. The present example is very bold, with full inner details and nearly full legends, including full LVIS PRIMERO (not just PR) and POTOSI (the pillars side slightly off-center). The above is an extremely rare and currently unique Potosi, Bolivia, cob 4 reales, 1732YA. This is a very important 4R, as it is the ONLY date and assayer (not counting overdates) that we have NEVER seen in our 25-year study of Potosi pillars-and-waves cobs. The above is an extremely rare Potosi, Bolivia, cob 1 real Heart, 1718Y. It’s an attractive example of the classic Heart shape and like most Heart minors, this specimen is probably unique. The above is a Bogota, Colombia, cob 8 reales, 1670, assayer PoRS. It’s the finest and only known specimen in NGC census (NGC certification #4348135001) and is certainly among the choicest Bogota pillars-and-waves cobs in existence, in fact the highest of all Bogota cob 8R at NGC by two grades. The above is a very rare Nicaragua (Leon), provisional “imitation cob” 2 reales, 1823 P.M.P.Y. It is probably the finest known of this Leon type with “pine tree” tops of pillars, a type rarely seen without a hole or significant damage. See Carlos Jara’s book Central American Provisional and Provincial Mints (2007) for more information about the attribution of this type to Leon. We hope you find exactly what you’re looking for in our upcoming auction and please feel free to contact us with any questions you might have. You can see coin lots in person this weekend (and see Dan, Augi, and Connor) at the Whitman Expo at the Baltimore Convention Center November 3-6. In this blog, we will cover some of the big-ticket items (i.e. gold and gold and silver bars) you can find in our upcoming auction. These coins and bars are important for either their rarity, their quality, their provenance or all of the above. They are for the discerning advanced collector who can afford the best. These lots also represent historical treasures which anyone can appreciate whether they can buy them or not. The above Lima 8 escudos cob is the finest known of its type in the NGC census with a grade of MS 63. Dan has described it as “a superb specimen all around, befitting the top honors.” Over and above that, it’s from the 1715 Fleet! Another Lima 8 escudos cob, this coin is tied for finest known in the NGC census with a grade of MS 62. Dan’s description: “Clearly top grade but probably also the best in terms of strike, and apparently one of very few of this date and denomination recovered” from the Luz. ‘Nuff said! This Potosi bust 4 escudos is the finest and only known in the NGC census with a grade of AU 58. As Dan has noted, only 170 pieces (both laureate and non-laureate types) were minted and this date is the rarest bust-type issue in any denomination from this mint. It’s “a trophy gem and has no equal in any sales records known to us,” with “trophy” seeming like an understatement! The above is a Lima, Peru, bust 8 escudos from the time of Ferdinand VI and dated 1751. This lot is “one of only two of this ‘large wigged bust’ type” from the Luz shipwreck. Pretty rare stuff! Another important bar, the above gold “finger” bar is encrusted with coral as from the “Golden Fleece wreck” and was made “in a period when gold coins were not yet made in the New World and ‘oro corriente’ was being phased out” says Dan. Shipwreck bars are always in demand in our auctions. A very unusual silver “tumbaga” bar (#M-61) whose “most intriguing aspect is a large area of exposed pure copper, revealing how most ‘tumbaga’ silver was created by hammering silver and copper together and therefore showing the true nature of ‘metal of Michoacan’,” according to Dan. You should read The Tumbaga Saga by Agustin Garcia Barneche to learn more about these important and fascinating early silver bars. What’s an auction without a large silver Atocha bar (#451)? As Dan notes of special importance, accompanying this bar is a “complete manifest report, which was an optional (and mostly declined) item when the bars were first distributed.” Rarity and provenance! That’s all for now, and we hope this note will whet your appetite for our auction. Our upcoming Sedwick Treasure, World, U.S. and Paper Money Auction #20 has something for everyone, and I’ll outline some highlights in upcoming blogs. First off, let’s show off our paper money section, a collectible that we haven’t been able to offer in great amounts but should become a staple of future auctions thanks to the hard work and expertise of our new employee, Connor Falk. At first glance, this colorful 1996 Cayman Islands 10 dollar note is appealing for the beach scene on the reverse, an open treasure chest residing beneath a palm tree as a sailboat moves in the shallow waters. But there’s an interesting backstory on this note: it shouldn’t exist. 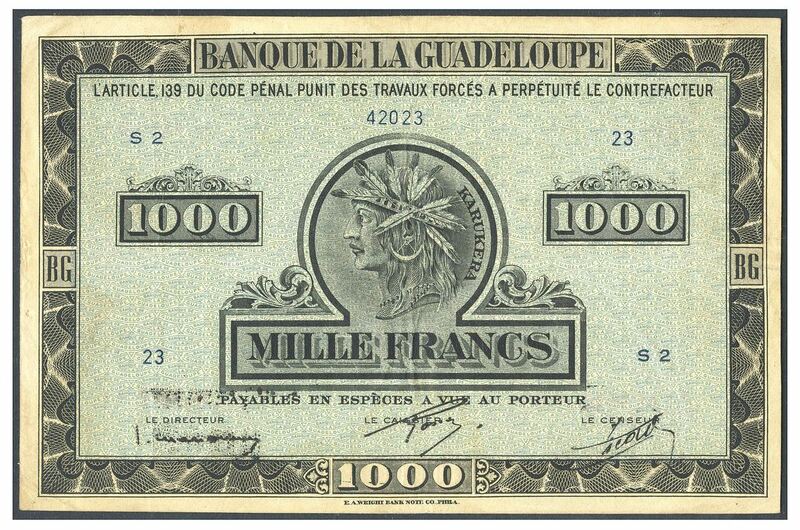 The X/1 series of notes were test notes printed by De La Rue on experimental paper, analyzed and then destroyed. A small number escaped, making them among the rarest of Cayman Islands notes. Add the fact that PMG certified this note as Gem Uncirculated 65 EPQ and this lot is an impressive rarity sure to be the cornerstone of a Caribbean paper money collection. This 1889 100 pesos Colombian Bond is very rare with only four or five known and is the plate note featured in Compendio Historico del Papel Moneda en Colombia by Danilo Parra Ariza. It features a light blue underprint and a well-executed design including a vignette of a man with a burro cart. Other examples are known to have cancellation marks including punch holes and rhombus-shaped cuts, making this lot all the more attractive for its lack of major marks or cuts. This the 1889 10 pesos, similar in design as the lot above yet featuring a popular vignette of a dog. A very scarce and popular note with a central vignette of a Carib Indian, also featured on other Guadeloupe banknotes and coins. 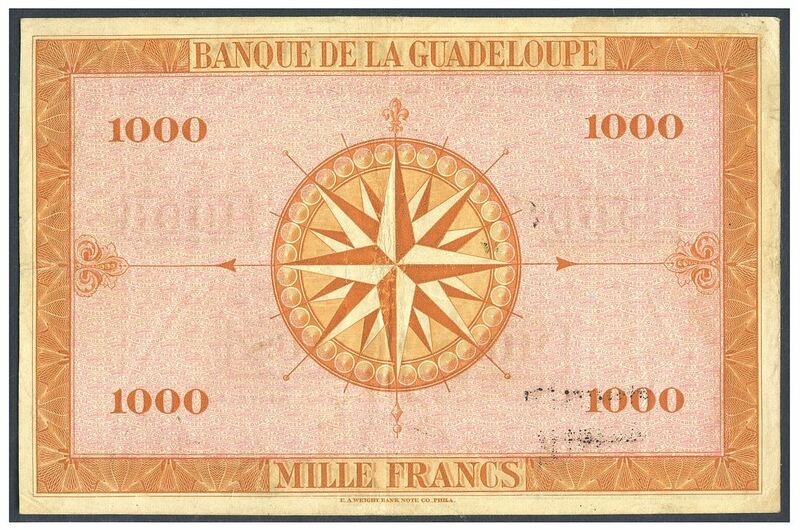 The Caribs called Guadeloupe “Karukera” which translates to “island with beautiful waters.” Connecting with Guadeloupe’s maritime past, the reverse features a large compass rose. There are some folds and soiling, but the numerous and heavy folds that plague large notes like this one are not here, hence why PCGS certified this note as Very Fine 30. These two Mexican notes are extremely popular and in demand due to the beautiful tri-color reverses honoring the colors of the Mexican flag. Printed to commemorate the 100th anniversary of the Mexican War of Independence, they are also the first commemorative banknotes in the world. Examples are scarce with notes in VF and higher rare while collectors give special attention to those with bright colors. Check out Session 4 lots 1500-1623 for all of our bank note offerings. Last week Dan, Connor Falk (our new employee) and I traveled to Arizona ahead of Hurricane Matthew to show auction lots for our upcoming Auction #20 (more to follow on that tomorrow!) and give some presentations. We were a little unsure about leaving with a potentially dangerous storm bearing down on us, but when the going gets tough, the tough leave town. As it turned out, Matthew took an eastward jog and spared most of the central Florida area. important Mexican coins from the vast collection at the Society. She will also attend our Auction #20, so if you’re attending it as well, you’ll want to meet and talk with her. Augi, who stayed in Florida to make sure the hurricane didn’t blow away our office, won an award at the convention for his well-received book, The “Tumbaga” Saga, Treasure of the Conquistadors. We’re fortunate to have a very cool “Tumbaga” bar (Lot 210) in the Auction. Dan took an award for his participation in the Counterfeit Forum last year and did so again this year. The presentation was extremely well received. I spoke on the Charles and Joanna coinage from the Mexico City mint, sharing some new research I’ve undertaken. All in all, it was a quick respite from the desk and chair. If you’re a collector of Mexican coins, you should become a member of the U.S. Mexican Numismatic Association and attend next year’s convention.